Summary (from the author's website): Bod is an unusual boy who inhabits an unusual place-he's the only living resident of a graveyard. Raised from infancy by the ghosts, werewolves, and other cemetery denizens, Bod has learned the antiquated customs of his guardians' time as well as their timely ghostly teachings-like the ability to Fade. Can a boy raised by ghosts face the wonders and terrors of the worlds of both the living and the dead? And then there are things like ghouls that aren't really one thing or the other. This chilling tale is Neil Gaiman's first full-length novel for middle-grade readers since the internationally bestselling and universally acclaimed Coraline. 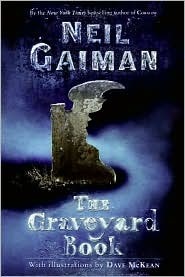 Like Coraline, this book is sure to enchant and surprise young readers as well as Neil Gaiman's legion of adult fans. I need to start this review off by saying this: there are books that change the way you think about things, and then there are books that take you back to a time and place you thought you would never revisit... The Graveyard Book was definitely one of the latter. It took me back, somehow; reading it, I was reminiscent of the nights when I was young (umm... younger) would stay up late re-reading my favourite Harry Potter books, the cover drawn up tight over my head. This book reminded me of those times when you feel like you need to escape, while somehow managing to remind me of those nights when you know there's nowhere you'd rather be. Does that make sense? Yes? No? Well, at least I tried! "There was a hand in the darkness, and it held a knife." Seriously. That line made me want to stay up all night reading it - sadly, though, I was in the middle of 3 other books at the time that I first read that, so I had to wait a little while. The man Jack (I'm just gunna refer to him as 'Jack' from now on), is furious, vowing that he will get the job done even if it is the last thing he ever does. He rushes down the stairs and finds the front door open. Meanwhile, the little boy has somehow managed to toddle his way down the road and up a hill, to where the abandoned graveyard sits, undisturbed for the past few decades. Propelled forward by the spirit of his mother and father, the baby arrives at the gate of the graveyard, where he is spotted by a few of its inhabitants - the ghosts - who are reluctant to let him inside. That is, until the Owens see the baby - they spent their lives praying for a baby, and now that one has appeared, they'll be glad to care for it. There is a moment where the baby's parents linger in spirit form and ask the Owens to take care of their son, and the Owens promise to care for him and keep him safe. But Jack is on the baby's trail, and the rest of the inhabitants are weary of the living... until the Grey Lady - a mysterious woman on a horse - tells them to grant the baby all the powers the graveyard has to offer. The motion is passed, and the baby is granted the Spirit of the Graveyard - an honor no living person has ever been given - which allows him to move freely within (and be protected within) the graveyard. Guys, I don't think you realize how difficult it is to summarize this book! There's just so much to talk about, but I'm trying not to give too much away... Neil Gaiman's writing is beautiful, flawless - it's a lot like poetry, I think. It picks you up and lets you float along... picture doing a back-float in a lazy river (or something along those lines). Gaiman's writing is gentle, but it still holds your attention; it's definitely one of the things that made me love this books so much. OK, final thoughts on this book: I'm not going to go all philosophical again, but guys, this is an AMAZING book. Read it. Buy it. Follow around your spouse / parents and nag until they get you it. Then, read it all in one sitting. Please, please do. I promise, you will cry at the ending (just like I did!) and you will not regret a single moment. NOTE: You could also try entering my giveaway! I'll be giving away The Graveyard Book, along with Coraline and Living Dead Girl. Go check it out! I loved this book too. I thought the father-son style relationship between Bod and the vampire (can't remember his name) was really well done. This was a wonderful book with an edge of creepiness to it. It is quite hard to summarize, but you did a good job of it! However, I wish that there had been more to the ending. Thanks for your review! Follow Friday & Blog Hop! Ravena & The Resurrected - Giveaway!